I am a glutton when it comes to leashes, harnesses, dog jackets, dog toys, dog treats, technology for your pet……you get the idea. 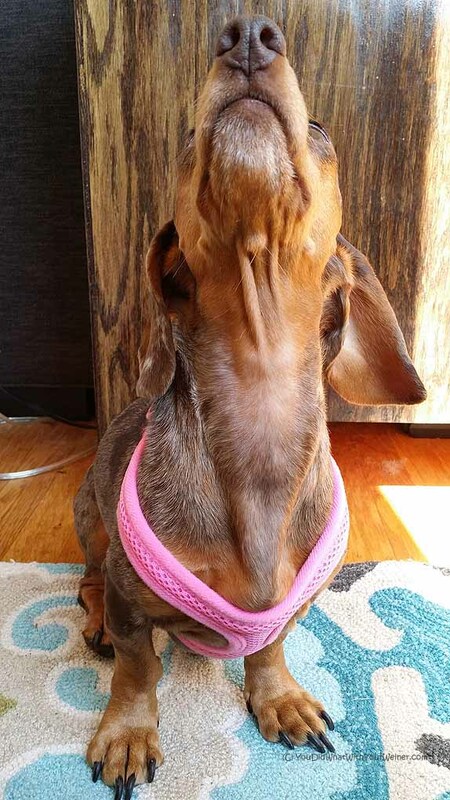 I’ve tried almost every harness recommended for Dachshunds and my favorite so far is the VelPro Choke Free Mesh Harness (affiliate link which means I get a tiny percentage if you buy to help support this website). It’s great for any small dog really. I first saw this harness at the Superzoo Product Expo last summer. Superzoo is the place companies go to show off their new innovations, prototypes, and products. The company displaying the new, mesh version of the Choke Free Harness only had a few prototypes on hand. The harness was EXACTLY what I had been looking for so I convinced the owner to sell me one for Gretel before I headed home. There are two main reasons that I am in love with this harness. First, Gretel is a real puller and, possibly due to extra skin inside her throat, allergies or an irritated trachea from pulling, her breathing is labored sometimes (nothing serious but it sounds like she is snoring). I was really afraid of her trachea collapsing. I’ve tried several different harnesses but they all put some kind of pressure on her throat (the one that didn’t fit loose and she could back out of it) and cause her to cough and wheeze. The VelPro Choke Free Mesh Harness puts all of the pressure right on her breastbone. Second, the harness is easy to clean. Our harnesses get muddy and wet a lot in the Northwest so they need to be durable and machine washable. I have seen similar harness styles to the VelPro Mesh Choke Free Harness but they were made out of leather that had to be conditioned to stay supple and took more effort to clean them (in fact, you CAN buy this harness in a leather version). I do have ONE negative thing to point out about it. To close the velcro strap, you need to pass the side with the slot in it over the metal D-ring. Chester and Gretel don’t wear a collar so I attach their tags to the harnesses. In the case of this harness, the only place to attach the tags is that D-ring and the tags are too big to pass through the hole. That means that I have to remove the tags, put the harness on, and re-attach the tags. I use a Rubit clip to make tags easy to take on and off so it just ads another simple step to the process. I admit that it was annoying at first but now I am used to it and barely think about it. The other day, one of our Facebook fans saw a photo of Gretel in the harness and asked me where someone in lower mainland Canada could get the harness. I don’t live in Canada so I am not familiar with Amazon policies for shipping there. It looks like they do ship there though. I found this “shipping rates to Canada” Amazon Page to help calculate the shipping charges. 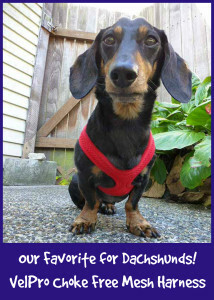 If you live in Vancouver, Canada you can also order the harness from Morrco Pet Supply Company for shipping to Canada. It looks like the shipping fee is $10 but I would email and confirm before you order. The instructions for measuring the correct size say to measure around your dog’s chest right between their legs (in the arm pit). Gretel’s chest measures 15 inches and Chester’s is 16.5 inches. I have a medium harness for both dogs which, according to the VelPro website, fits a chest of 15 – 16 inches. When the medium harness is new, it fits Gretel perfectly and is tight on Chester. Once it’s worn and stretched out a bit, which it does a little normally and will do a lot more if your dog is a puller, it’s perfect on Chester and a bit lose on Gretel. In other words, the sizing chart seems very accurate to me. However, the instructions on the website say to measure the chest and then add an inch to get the correct size. I don’t recommend adding that extra inch because the harness stretches out after a while. Thanks for sharing this info. I haven’t found a harness yet that mine can’t wiggle out of. Plus they’re too many straps and stuff to get on. I like the one Gretel has on. It looks simple yet sturdy. Those look great! I’ve finally found a harness I’m happy with for Ruby but it took a lot of trial and error. I have found that they are a bit like handbags in that you don’t really know how you’ll like it until you’ve used it for a while. That gets expensive! i been experimenting making harnesses for my doxies. this is exactly what i’ve trying to come up with. thanks. HINT: my pups don’t wear collars either, my solution to this would is using a light weight elastic cat collar, i just slip it off and on over their sweet little heads. Yes, that would be another solution. It’s still an extra step so, personally, I would rather just stick with the Rubit Clip method. If I was just starting out with these I might go that route though. Love these! So many of the mesh models I’ve seen still have webbing around their bellies, which chafes after a while. I attached Silas’s Rubit clip to his leash when we were alternating between a lot of harnesses. Not the moving parts of the clip, but the base where the leash clip attaches to the fabric. We have his in a Quiet Spot neoprene cover, though. It would be really jangly there otherwise. Why no collars? Not to be contentious–genuinely curious. We go back and forth about it. Most of the time Silas wears a very soft embroidered one with no leash clip. I don’t think this is what you are asking but I would never walk my Doxies on collars (Anymore anyway. I used a collar on Chester when he was young and learned my lesson) because it can put undue strain on their fragile necks and backs, potentially leading to injury. It also puts pressure on their trachea which is prone to collapsing on small dogs. This is what I think you were asking: I don’t put collars on them for vanity purposes, really. Their fur his really thin and it was breaking the hair and wearing a bald spots on their necks. I thought it was just us but I’ve actually heard from a few people that it happened to their Doxie too. It seems Doxies are prone to alopecia. Chester’s chest is about bald. Summer is coming and they like to hang out in the back yard. I don’t want to have to put their harness on but letting them out without ID is too risky. I am setting up special collars and tags for wearing in the back yard. I AM concerned about them not wearing collars and ID in the house because what if they escape out the door? They are microchipped though and my neighbors kind of know who they belong to. Chester will only go as far and the nearest hand that will pet for feed him anyway. It’s on my mind but I feel like the risk is low. I know it only takes once but they haven’t worn collars and we’ve never even had a close call. Yep, that reasoning all sounds very familiar to me. Plus, Silas has some kind of contact metal sensitivity. Nearly-hairless dogs, unite! I’m quite skeptical of walking dogs in collars, no matter how big they are. If your dog is an angel on leash, and not likely to have collapsing trachea, sure. The rest of us? Harness all the way. We use the Smoothie Tag collar from k9closet.com, if you’re looking for one. (She has Italian greyhounds and Sphynx cats, so she knows how to do nearly hairless.) It has our number embroidered on, so I can skip the tags but have some basic ID if he just darts out the front door or something crazy. Plus, Silas is SO skittish that I’m afraid he wouldn’t let a stranger grab his collar to check his tags. Sometimes it can be so hard to find what you want in a harness. Since we have hard to fit dogs, too, I feel your pain. When you find something that works, you have to really stick with it! Harnesses are like jeans, there are so many different styles yet so hard to find the right pair :). Penny is a puller, and so far the Puppia harness works great for us. When the time comes for us to try something different we will make sure to check out your source. We love the look of it on Gretel, it doe look comfy the way it fits lower on her chest. When dogs wearing collars pull it can damage their neck. Unfortunately that’s what makes us use a pinch collar on Dolly as she won’t pull or choke, she has a way to yank with it which just shows you how hard she is to walk. We tried the gentle leader and didn’t like it and are always looking for a different harness for her. Thanks for the great info. Hopefully the company picked up some orders at SuperZoo which will make it easier to find in the near future. Yeah…this harness does not REDUCE the pulling. Gretel almost broke my little finger when she saw a squirrel in the park the other day! I can really use this, not only for the Doxies here at Silverwalk Hounds but for my Beagles. They pull more than the Doxies. Thank you for sharing. I do keep collars on almost everyone. When state inspects us, they want to see collars and name tags. I use collar tages instead of hanging tags for safety. Hi. This harness looks perfect. Will there be one to fit my new puppy (long haired mini) when I bring her home in a couple more weeks? Hi Angie. Are you asking if they make them small enough for a puppy? Possibly. Gretel is 10 lbs and wears a small but I think they do make an XS also. You would have to check the website and take measurements when your puppy arrives. Even for the XS though, it might not fit until the puppy is 6 months or older. Thanks soooo much for this review! I’ve been on a 10 month odyssey trying to find a harness that would fit, not choke, not cause my Dachshund x Chihuahua discomfort, not allow him to slip a front leg through the neck opening, and that he can’t get pee on the girth strap. All to no avail. Awhile back I tried the similarly designed Buddy Belt only to have him start actively avoiding having it on, all I can figure is that it was either uncomfortable in his arm pits even though I used the pad things that are supposed to help with that, or the HUGE buckle over his shoulders caused him discomfort. Hopefully the Chokefree Vel Pro mesh one will finely end this harness odyssey. If I had back all the money I’ve spent on harnesses that he can’t wear, I’d be able to buy him a Paco collar that his nearly hairless (I swear he must have Chinese Crested in the family tree) front of the neck couldn’t handle! I hope it works for your pup. Gretel is kind of hairless on the front of her neck to. Dachshunds are known to be prone to alopecia, or hair loss. This one hopefully won’t rub and irritate the skin there. Gretel’s bald spot is a little higher up than the harness hits. Hi Emily. Sorry it took me so long to respond. No, they never have slipped out of the harness. I have to admit though that they are not ones to pull hard in reverse. Chester is slow so sometimes I have to give a forward tug to encourage him but there has never been any danger of slipping out for him. Each dog is different so there is no guarantee but I would be surprised if a dog slipped out. The harness rests in their armpits so it kind of “hooks” them if you are pulling forward on the dog. I purchased the Velpro mesh harness. After going through many harnesses that worked great for our other 2 dogs, you peg it with this review. I have a dachshund from the pound that joined our family a few months ago. Other harnesses choked or caused her to cough after our walk. We love to hike/walk and so does “Butter”. Fast or slow pace, we are having no rubbing issues or hesitation on her part. When she sees a rabbit or squirrel and transforms into a nibble ninja – no issues arise. Sizing seems true for the VelPro and no back out issues. We ordered a medium (15″ girth – 12 pounds). Morrco had the best pricing and ships super fast (even 5% promo code). Thanks so much for your site – you saved us a lot of time and $$. I am glad it worked out for you! And thanks for sharing your experience. Hey Jessica! I was so glad to find this blog because I’ve been struggling to find the perfect harness for my dachshunds after years of only finding crappy ones. I just ordered and received two of these from morrco.com and have a question I’m wondering if you can answer for me. I ordered two size large harnesses for my doxies because I measured them where the website said to and they were 18 & 18.5 inches around their chests. However, the harnesses are a tad loose unless I pull them closed a little tightly (as the slit is wide enough for a little adjustment with the ring coming through). I’m wondering if I would be better off ordering a medium but didn’t want to pay the shipping and return shipping if it would just be too small. Do you find that they stretch out quite a bit? I know you said Chester wears a medium and wondered if you would mind telling me his chest size so I can maybe see if a medium would work for my dogs. I know the website says that one is for a 15 to 16 inch chest but I’m wondering if their measurements might be a little off. Thank you so much! Hi Sonya. The slit in the harnesses is long to allow for a little bit of custom adjustment. If they are just “a little loose” then the smaller size would likely be too small. Chester wears a medium but it is almost too tight for him. The large was way too big though. Chester is about 13 lbs and right on the border of the medium and large at 17 inches. As for stretching out, they will a little bit. Not a whole lot though unless your dog is a puller. For example, before I broke Gretel of he pulling habit (or rather, she broke herself of it) she used to pull hard. The small harness was almost too tight for her initially but stretched to a perfect fit after a couple weeks. Awesome. Thanks for letting me know. I’m glad to see it’s getting easier to buy. I’ll try to find it on Amazon and add the link here. You talk about pulling but a harness that attached at the top won’t stop a dog from pulling. A harness that attaches in the front will stop pulling, because when the dog pulls, he will start to turn. You can control a dog that is pulling with a harness that attaches in the front. I’m not saying this harness may keep a pulling dog from choking, but I stopped the pulling completely in a couple of days with a front-range harness. Thanks Marc bur I never mentioned that my goal was to get Gretel to stop pulling nor that this harness would stop any dog from pulling. My intention is to keep her safe on the occasion that she does pull and this harness is perfect for that. On another note, we tried the front range harness and did not have the same experience. Glad it worked for you and your pup though. i just ordered the valpro mesh harness in a small for my mini dashound thats 12 ish pounds i hope it will fit she usually takes a xs in the rc pets mesh harness . can’t wait to try it ! Hi Chris. These harnesses are intended for all types of dogs so I would say yes. We are new to the dog owner community, so I was thrilled to find your site! We’ve been searching for a harness for our 8 month old Wire-hair doxie Greta. We’ve been thinking about the belt buddy, but I was concerned about chafing the armpit. I’d like to try the valpro instead – but our issue is that Miss G HATES (is afraid of?) velcro! Is it a thick band of velcro? Hi Lee. Welcome to being a dog owner! 🙂 I’ve heard great things about the Buddy Belt. I’m also concerned about chafing but plan to try them sometime to see. If Miss G hates Velcro, the Velpro Mesh Harness may not be a good one for you guys. In order for the Velco to hold securely, yes, it is thick. I would say maybe 1 inch wide and 3 inches long. I have a one year old wire hair mini dachshund, and I can’t find a harness I can keep him in! Anyone have any comments about these for staying on, not slipping off? Hi Charlotte. Iv’e been using these harnesses for years and have never had a problem with my Dachshunds slipping out. Maybe if you explained a little bit about HOW your dog slips out of his harnesses I could address your question a little better. For example, do you mean while out on walks? Also, what other harnesses have you tried? He slips out if he refuses to walk forward. I have 2 dachshunds, and use a double leash. I’m sure he has just slipped out as if he walks out of it too. I adjusted it tight, but must be slipping. This harness fits right in their armpit. If your dog refuses to walk forward, and you continue to pull on the harness, it will just pull tighter into their arm pit. I’m not promising that he couldn’t flail around and contort himself to get out of it but I would find it very unlikely… and almost impossible if the harness is a snug fit. The mesh harness is not available on Amazon. Any other place to purchase? Hi Roxanne. I am positive the harness is available on Amazon. I rechecked the links in my article to make sure. Here is the link again: http://amzn.to/2l4xNvi Please let me know if you are still having trouble. I got this harness for little Wellington, and it fits perfectly! It was a little big on him when I first brought him home, but now it fits really well now that he’s 16 weeks old. Hi Jackie. I apologize for my delay in getting back to you. I have been sick. Unfortunately, it’s hard to find a front clip harness small enough for a 16-week old Dachshund (assume that is what you have?). The very smallest Easy Walk harness may work. If I remember right, it goes down pretty small. The premise of a front-clip harness is that when a dog pulls, it turns them around… thus not “rewarding” them from pulling. They pull because they really want to go somewhere and the front clip harnesses makes them “change direction”. This can also be taught with a regular harness and training. You can find many articles online about teaching your dog not to pull. The idea though is that ever time your dog starts to pull, you turn and walk the opposite direction (or turn a corner). At first, you may have to literally pace back an forth in a tiny area. But eventually you may be able to take a few extra steps without him pulling. Hi! Would you recommend the velcro harness for a mini poodle who just had surgery for IVDD? He is making a nice recovery so far. He is only 3 years old. I always used a leash but need to switch to a harness. My 7 year old doxie just had neck surgery for a herniated disk. This harness is awesome. It stays below her chest bone and uses her shoulders for all the pressure. My 1 year old doxie gagged and coughed with every other harness I used. Not with this one. Thanks for sharing your review. That’s exactly why I love it so much. Thanks for sharing. 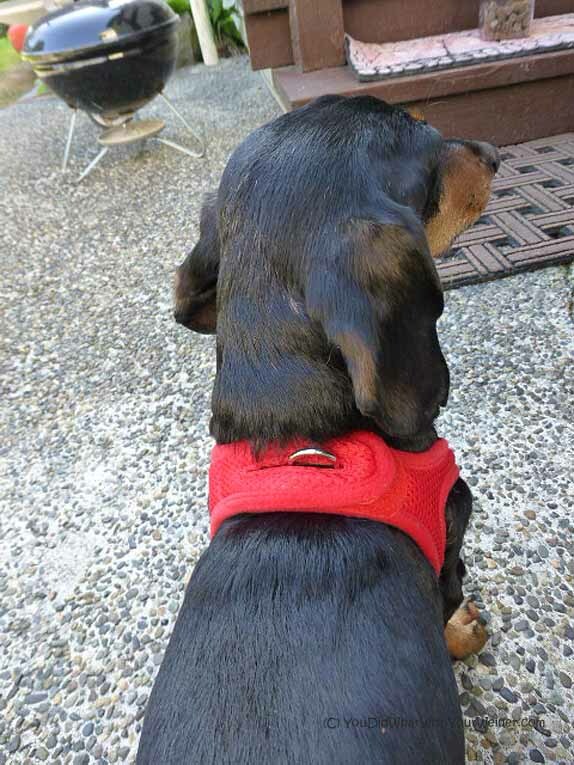 Thank you so much for recommending this harness for Dachshunds and other dogs with funny shapes. To me it feels like even when you have a Dachshund mix you are bound to deal with harness woes. My Dachshund/Yorkie mix Mimi can’t fit a lot of the harnesses out there. Her narrow protruding chest bone defeat strap harnesses and her skinny neck size of 9 often times makes normal harnesses huge on her neck even when they fit her girth size. I very recently had to return two Lupine harnesses- the Roman and Step-in because of this. Puppia’s soft roman harness is the one of the few harnesses that actually fit her. I had a Buddy Belt 2, but the quality only lasted for a year of use and I don’t want to pay over $40-50 for the original. If you’re going to try a Buddy Belt stay away from the Buddy Belt 2 and get the original if you have the money. 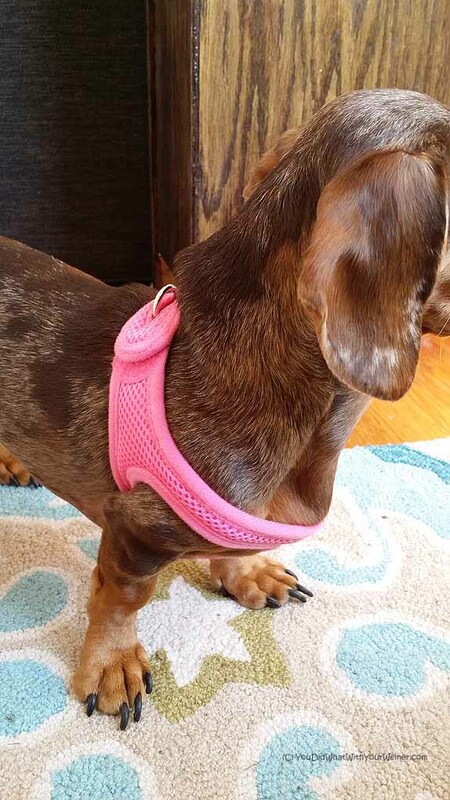 I like how this harness is designed and it doesn’t look too restricting on your Dachshunds at all. I decided to buy it on Amazon today and it will come on Sunday. I bought the pink and I can tell that it’s going to look great with my brown Yellow Dog rope leash. I have my fingers crossed just in case it doesn’t work on Mimi. I hope it works for Mimi! The harness came in the mail and so far it’s pretty much perfect on Mimi. Her movements are not restricted at all and it molds to her chest bone nicely. I read about how this harness stretches out a bit so I will keep watch of that but other than that it’s nice to have another harness besides the Puppia harness. One reviewer on Amazon said that this Velpro harness has a hard edge that pinched a nerve in her dog’s back and she had to stop using the harness after consulting with her vet. (Despite that problem she gave it a 4 out of 5 stars.) That concerns me. I avoid the standard “step-in” harness for a similar reason–the hard buckle is right on the spine. And that’s also where the leash attaches so the force is greatest right at the buckle. Right now my go to harnesses are a standard “H” harness from Yellow Dog Design (made in the USA!) and the Gooby Comfort X. For me, a standard “H” shaped harness fits my dog around the chest well enough without putting pressure on the throat. The Puppia harness are really comfy but they do put a little pressure on the very bottom of my dog’s throat but my dog seems comfortable. The Good2Go harnesses from Petco are very similar to the Puppia harnesses but they have a slight dip at the neck. We did a test fit in the store but I didn’t buy one yet since they have mixed reviews and are pricy compared to others. My favorite so far is the Gooby Comfort X harnesses. Only cost $9.09 shipped from Amazon or locally at Petco (with pricematch to online Petco.com price). They are soft like the Puppia harnesses but the “X” shape doesn’t put any pressure on the neck. At least two companies have copied the pattern but I haven’t tried the clones yet. Haven’t tried the Ruffwear Front Range since it looks a bit stiff and bulky for a small dog. I found your product reviews very helpful. Thank you. Hope my comments are also of use to other dachshund owners as well. Hi Jake. Thanks for sharing your experience. Since I’ve really only reviewed this harness, your comments may help others looking for alternatives. We’ve tried literally almost 100 harnesses, including some that you mentioned. This harness is still my favorite. We haven’t had any trouble with the stuff (but a little flexible) part on the back where the two pieces of Velcro overlap. However, harnesses can certainly fit different dogs differently. Even from the same breed. I think you are correct about the Front Range harness. At least that was our experience of it. Chester and Gretel are skinny. Some of the bigger Dachshunds in our club have the harness and their owners seem to like it. I still think it looks a tad bulky on some of them. Great company and product though. It’s just not for every dog.